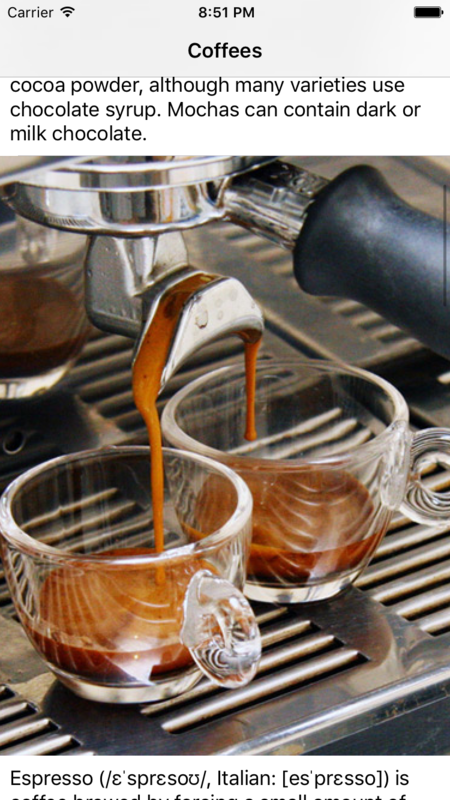 We will be creating a simple coffee apps that explains the different kind of coffees. 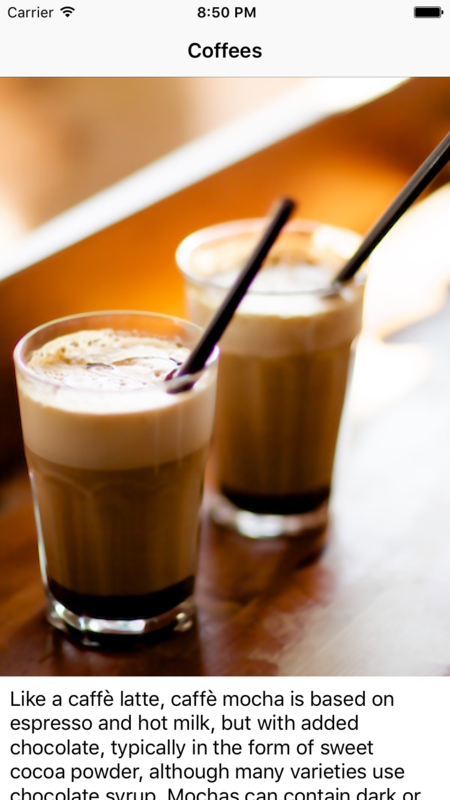 The app will have a coffee image and its descriptions in each UITableViewCell. The images will be in different sizes and the number of characters in descriptions will be different as well. Create a custom UITableViewCell with a UIImageView and UILabel in it. 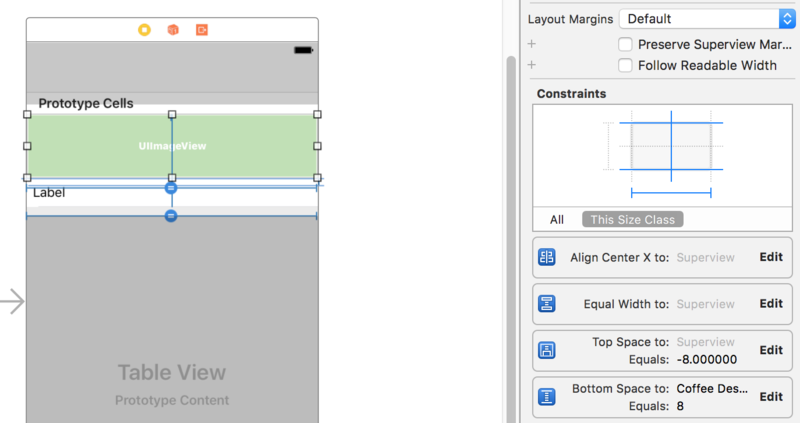 Set constraints for UIImageView base on the screenshot below. And follow the following screenshot for UILabel. Next, we will need to let UITableView know that we want the rowHeight to be automatic determined. estimatedRowHeight not only help with the improve of performance when loading tableView but it also need to be set to any value bigger than 0. By default the value is 0 which means there is no estimate. Providing a nonnegative estimate of the height of rows can improve the performance of loading the table view. If the table contains variable height rows, it might be expensive to calculate all their heights when the table loads. Using estimation allows you to defer some of the cost of geometry calculation from load time to scrolling time. When you create a self-sizing table view cell, you need to set this property and use constraints to define the cell’s size. The default value is 0, which means there is no estimate. Next we will create a custom CoffeeTableViewCell class and Coffee struct. Our Coffee struct will be holding a imageName and description of the coffee. In storyboard, update the cell to our custom class CoffeeTableViewCell. Then create an @IBOulet for the UIImageView and UILabel. In the CoffeeTableViewCell we will create a configure function to update its IBOutlet with a Coffee model. 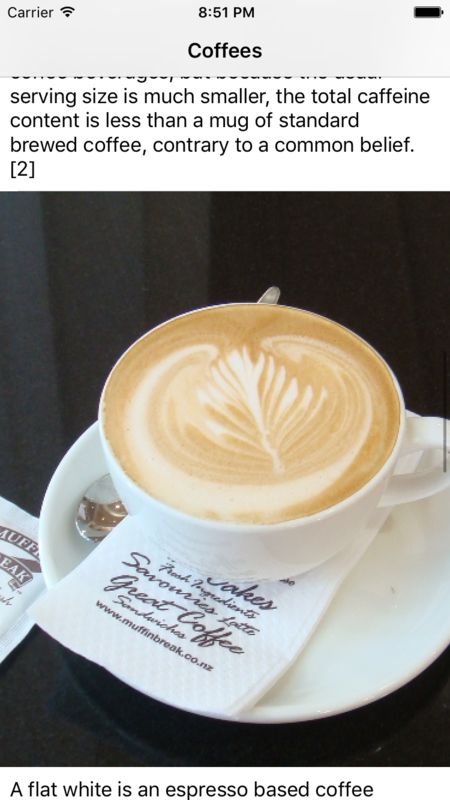 @IBOutlet weak var coffeeImageView: UIImageView! @IBOutlet weak var coffeeDescLabel: UILabel! CoffeeService is just a fake service class with a completion func that return [Coffee] like it is being fetched from a api call. Lastly, setup the datasource with the required func. Remember to hook up the delegate and datasource from tableView to CoffeesViewController in the storyboard. A sample project could be download here. Thats all you need to setup a self sizing UITableViewCell. Ensure that that the correct constraint is set in storyboard, rowHeight and estimatedRowHeight is also updated for tableView.